For many of the world’s millionaires, money provides a highly effective means to escape their home country when times get tough. They can pack their bags, and move their family and capital to a location that will provide superior opportunities for prosperity. According to a new report by New World Wealth, this couldn’t have been truer for 2016, as the amount of millionaire migrants increased by 28% from the previous year. In 2016, there were a total of 82,000 millionaire migrants that left for greener pastures. Here are the countries they’re feeling and flocking to. Here are the top 5 net outflow countries. Brazil continues to be deep in economic crisis, with its worst-ever recession likely continuing into its eighth-straight quarter in Q4 2016. The country also recently impeached Dilma Rousseff in August 2016. On the other hand, the Washington Post describes Turkey as a country that is in a “permanent state of crisis”. This may be a fair criticism, since in 2016 there was the assassination of a Russian ambassador, a currency crisis, an economic crisis, and also an attempted military coup. Like most people, millionaires don’t like uncertainty – and they have the wherewithal and conviction to get out of places that have ongoing issues. Here are the top 5 net inflow countries. New Zealand also had the amount of net inflows double, while the UAE remained a popular location for the wealthy in the Middle East. Demographics is super important, especially when it comes to the topical issue of housing affordability. 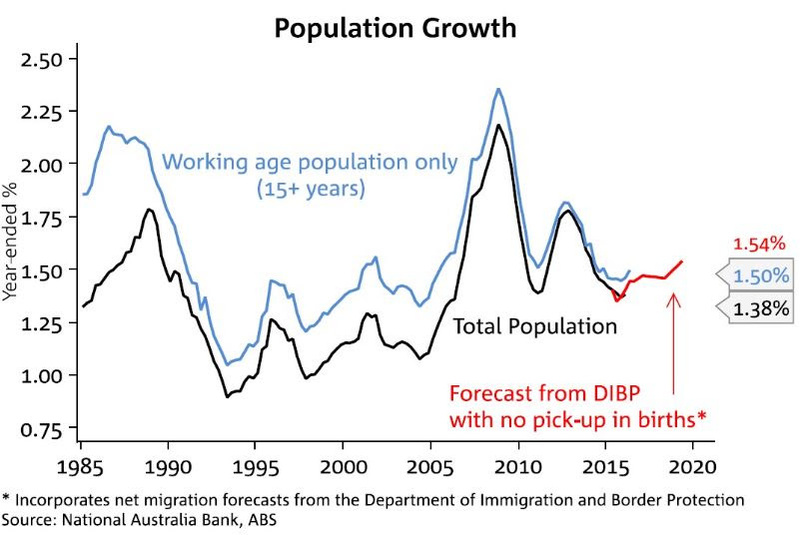 These charts show us the millionaires migrating to Australia. 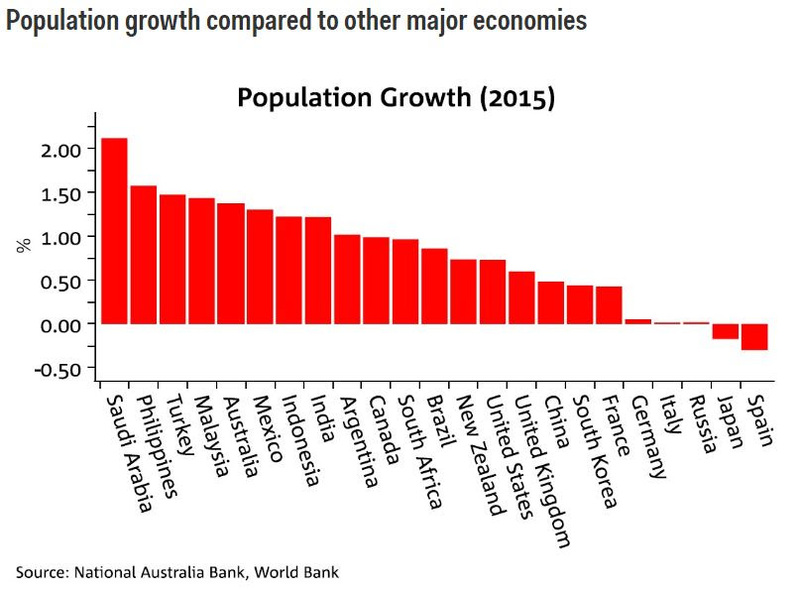 What they don’t show however, are the countries general population growth. To put this into perspective, we’re sitting at number 5 in the world! We need to focus on the bigger issue here. How we, as a country, as businesses, as people, accommodate and take advantage of this trend. We continue to see and read about President Trump’s policies, plans, old and new advisers, and what these mean for the stock market. I mean, some banks and hedge funds are using computer programs to trade instantly on his tweets. Yet one thing is very clear to me. It actually doesn’t matter. What Trump says or does, and whether this is good or bad for the stock market is pure speculation. Why? Because the stock market does not discriminate. It does not care who the president is. The average loss over all four-year terms was 30 percent. The average loss under a Republican administration was 37 percent. The average loss under the Democrats was 24 percent. Total returns under Democrats were 1,340 percent. Total returns under Republicans were 1,270 percent. This may come as a shock to many, but the President of the United States does not have a magic lever in his office he can pull to force stocks to rise or fall. It’s hard to believe, I know, but he doesn’t. The fact is, we’ve seen a massive recovery in the stock market since peak of the GFC. What we know for sure, not only with the stock market, but with any investment, is the higher the price you pay, the lower your expected return. A little technical, but the chart below highlights this point. 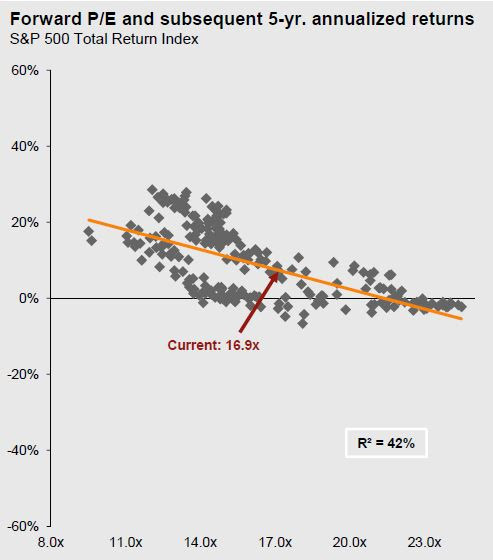 The higher the multiple you pay (across the horizontal axis), the lower your subsequent returns (up and down the vertical axis on the left hand side). Large gains are always followed by large losses, and large losses are always followed by large gains. You don’t need to be an expert to figure this out. This is the market. It’s an investor’s ability to ride through the ups and downs, and not succumb to buying at all time highs, and selling at all time lows, that will ensure the odds of positive returns are in your favour. 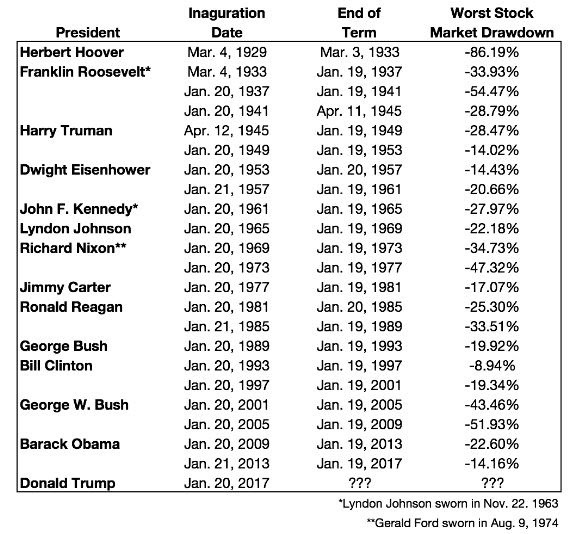 The market doesn’t care who the president is. I see so many different investment portfolio’s that come across my desk, and they all come is different shapes and sizes. Academically, I spent a number of years studying financial and risk management, so I have a vague idea of what’s going on. When I ask investors why the portfolio has been set up in a particular way, or why they hold certain investments, I usually get one of two responses: 1) “I don’t know”, or 2) “It’s performed really well”. I get it, it’s super hard to ignore past performance when evaluating an investment. I mean, it’s the first thing people trying to sell you something will point out. You hear the phrase so often, “past performance is no indicator of future performance” (or some variation of). But what does it actually mean, and is it a reliable indicator of future returns? Luckily for you, we’ve got the data. The table below (click for larger image) shows us the performance persistence over three consecutive years for US managed funds. Of the 687 funds that were in the top quartile in 2012, 18.78% managed to stay there the following year, and only 3.78% managed to stay there in 2014. Only 1.90% of the large cap funds were able to remain on top after 3 years. Past performance was not an indicator of future results 96.22% of the time. Next time you’re presented with an investment fund based on it’s past performance, please recall this email data. The stronger the past performance, the most cautious I would be. Odds aren’t in your favour. When it comes to wealth management, we spend a lot of time trying to figure out what it is that our clients truly value. I had a really interesting conversation with a prospective family recently, yet what they valued most was what majority of our other client’s value. That is, the health of them and their family, money, and time. I would also say in that order. Now, you can slice and dice up ‘money and time’, and call it whatever you like, financial freedom, flexibility, choice etc. At the end of the day, I believe that’s what it boils down to. Why do you think companies such as Uber and Airbnb have done so well? I’m sure you’ve heard the punchline, “Uber doesn’t own any cars”, and “Airbnb doesn’t own any hotels” (thank you all for stating the obvious). So what is it that they’re selling? People will tell you what these companies don’t own, yet no one talks about what they’re selling. Time. They’re selling time and convenience. And for a lot of people, time is money, or time is happiness. Scrambling hard to get back the time they spend on doing sh*t they hate. It’s one of the most valuable assets to most people, and for this reason, people are willing to pay a premium for it. Think about the last time you were on your phone and your WiFi connection was slow or clunky. How pissed off were you? We are living in a world where we have access to more information, more people, and the lens for opportunity is widening, yet we still have 24 hours in a day. My friends, we are craving time. In the wealth management world, where the investment landscape is as complex as ever, where legislation is changing so quickly and dramatically, where there are more and more products being manufactured for investor consumption, and as visibility gets cloudier, I fundamentally believe investors are looking for a comprehensive, yet specialised solution. And they’re willing to pay for it. This is why my firm offers a comprehensive set of services from strategic wealth planning, asset and investment selection, financial modelling and scenario testing, mortgage broking, to personal risk management, succession and estate planning, and philanthropy. Yet the areas of expertise are handled and advised by independent subject matter experts, where we co-ordinate, manage, and bring together the information and the right people. This allows us to have complete transparency and oversight over our clients’ affairs, so that ultimately, they’re affairs are working together reliably and efficiently. It means we can help them make better financial and investments decisions, without them having to run around and co-ordinate it themselves. Giving them the time to focus on other important aspects of their lives. I genuinely believe, if you’re in the business of wealth management, and you want to offer something that people are craving, it’s giving them the time to enjoy life and the things that make them happy. Being able to make arrangements, execute, and get sh*t done for your clients in the background, seamlessly with other subject matter experts (whether they’re existing relationships your clients have or introductions you’ve made), while your clients are on the golf course, setting up that new business, travelling around Europe, or down at the beach with their children or grandchildren, will be one of the most valuable aspects of your service. So stop doing stuff that adds no value to your clients, find out what really makes them happy, and go all in on that. I’ve found that it’s put my business in a much better position. I recently met a prospective family who sold their medical business and freehold mid last year. They’ve been sitting on cash for about 6 months now and have been reluctant to do anything. The fear, the uncertainty, and the horror stories they’ve heard have crippled them from making a decision. Yet, they have sky high aspirations and want to live life to the fullest. If they continue doing what they’re doing, it’s highly unlikely they’ll be able to do what they really want to do. During our discussions, we went right back to basics. 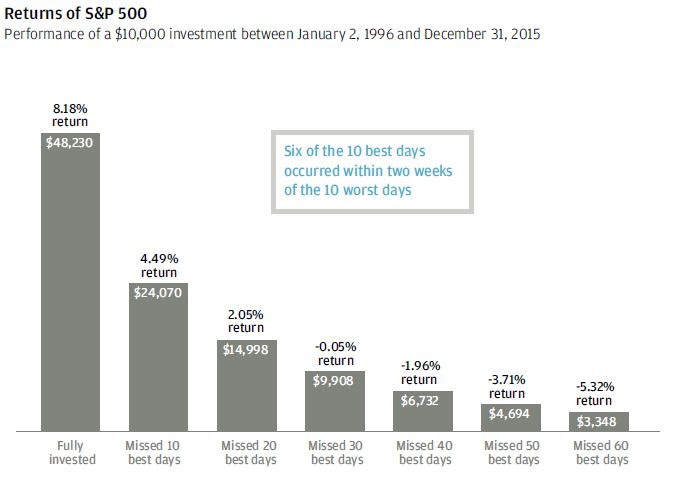 Time, diversification, and the volatility of returns. It’s something we talk to clients about all the time. Once you’re armed with the right information, you’re able to make much more confident decisions. The chart below illustrates just how time is your investment buddy. The bars show us the range of annual returns for an all stock portfolio (green), all bonds (blue), and an 50/50 stocks and bonds portfolio (grey) from 1950 to 2015 over various time frames. Let’s take a look at 1-yr rolling bars. The range of annual returns we saw during this time were 33% (at best), and -15% (at worst) for a 50/50 portfolio. Stretch your investment horizon out to 5 years, and your best and worst are 21% and 1% respectively. Push your horizon out even further, 10 years, you’re look at 16% and 2%. The point that I’m trying to make is, the longer your time horizon, the range of returns are compressed, and the lower the probability of loss. The shorter your time frames, the greater the probability for loss (click for larger image). This chart, as we refer to it as the ‘returns quilt’, ranks the performance of major asset classes each year since 2002. Check out Emerging Markets (EM Equity – orange box) as an example. Second worst in 2002, top performer in 2003, 2005, and 2007. Second worst in 2008 and top performer in 2009. And so on. You get my drift, super volatile. Great if you’ve got the time horizon and more importantly the stomach to ride it. The grey boxes, which I have marked with a red line, is a hypothetical diversified portfolio, which has had a much smoother ride along the way. And in fact, produced the third highest average annual return over 15 years (click for larger image). We’re always sold the horror story by the financial media and press. Yet when you look at the data with a wider lens, the story is much less frightening. The chart below plots the ASX 200’s intra-year declines versus the calendar year’s return. The grey bar is the return for the year, and the red dots are the largest drop we saw during that year (from peak to trough). For example, in 1997, the Australian share market saw a drop of 17%, yet the market returned 8% for the year. In fact, cast you eyes across each year. Notice how often we see the market drop throughout the year, in some instances significantly. Please don’t freak out, it’s normal! The share market, like any investment that will compensate you handsomely over long periods of time, will exhibit higher degrees of volatility. On average, the intra-year drops have been 14.3% (median 11.7%), and the gains have been 5.70% (median 8%). The odds of a positive return for the year, 17 out of 23 years – that’s 74% of the time (click for larger image). When investing in risky assets such as property or shares, you need to play the long game. Narrowing your time horizon will generally suffocate a positive result. Maintain a level of diversification. If you’re trying to chase the next big thing, or looking for that algorithm that’s going to make you millions, you’re going to lose. When faced with fear, uncertainty, and horror stories, look at the bigger picture and analyse the data to put the odds of success in your favour. I believe we all have dreams, small and great. Yet, I speak to so many people who’s story starts with “I wish”. When is that turning point in life where our dreams and aspirations fade into the grind of like? 1. My why. Before I did anything, I asked myself what am I doing and why. Stop wasting your life on doing stuff that a) doesn’t make you happy, and b) is not helping you achieve your visions and dreams. I meet so many people who tell me what they ultimately want, yet concede their actions don’t map their vision. Why? I believe the fear of failure is suffocating the excitement of victory. Believe me, I get it, I’ve been there and still encounter it. But is it really the ‘fear of failure’, or is it the fear of letting down the people who are closest to us? Our friends, our family. Is it the fear of embarrassment? Embarrassment in front of the people we admire or those who admire us? Once we learn to not care what other people think, the only thing that’s getting in our way is just getting out and doing it. Simple? Yes. Yet it was the hardest thing to do. 2. Be clear and definitive. What is it that you want to get out of life? What makes you happy? Is it to build that great company? Spend more time with your family? Travel? Set up that foundation? Whatever it is, we need to have clarity. If we don’t know where we’re going, how do we work out how to get there? In the end, we only get one shot at it. Make it count. Because when you look back at your life, and you’re 70, 80, or 90, you don’t want to regret the opportunities you didn’t take. Don’t let your life story begin with “I wish…”. 3. Size up your options and make it happen. Now that I was clear on what I wanted, all I had to do what reverse engineer it. Figure out what needed to happen and create a road map. Because without a plan of action, it’s just an idea. And ideas are great, but without execution, they’re worthless. Ultimately, the decision is yours. You can fear failure, which is temporary, or you can fear regret, which is permanent. Just remember this – with each and every decision you make, whether you like it or not, you’re writing your legacy. Here’s the annual amount of income that’s generated by a AU$100,000 investment in a one-year term deposit. This is one of the reasons why investors are moving funds to risky assets. In fact, in the United States, a 6 month CD (cash deposit) is not even keeping up with inflation and has not been since 2009. Forget over long periods of time, this is each and every year – mind the gap! When you hear the phrase, ‘cash on the sidelines’, this is what it means. A whopping $585,000,000,000 are held in term deposits through Australian banks, yielding around 2.5% pa.
Rate rises and stocks. Here’s the reality. If you think the current rate rises in the US are bad for stocks. History doesn’t agree with you. When yields are rising below 5%, rising rates have historically been associated with rising stock prices.